Would You Like To See an Elephant Fly? Disney has just announced that a live action film adaptation of the beloved 1941 animated movie DUMBO is in the works. The classic story entails a baby elephant being dropped off at the circus by the stork. Everyone is surprised when the baby elephant reveals his large ears, but he soon becomes the laughing stock of the circus and gets the demeaning nickname “Dumbo.” It’s a heartwarming tale of family and sacrifice that will soon be brought to a new generation in the live action adaption. Disney has enlisted Ehren Kruger, writer for the TRANSFORMERS franchise, to write the script and produce the movie. Also set to help produce the movie is Justin Springer, who previously produced TRON: LEGACY and OBLIVION. The movie is in the development stages at the moment, with Disney still deciding how to take on the job. 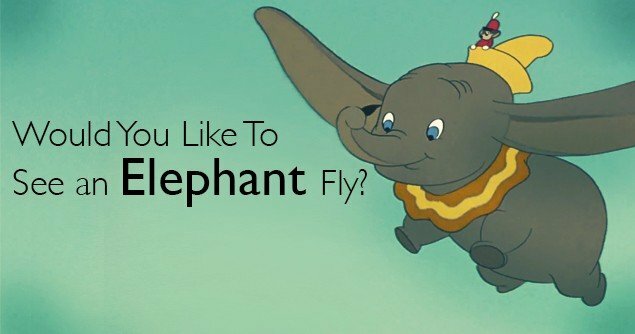 Ideas have come to surface to bring DUMBO to a live action adaption by creating a family story that will parallel the original animated story line or use CG technology (used to create the tiger in Life of Pi) to bring a flying elephant to life. Other recent live action movie adaptations from Disney include the release MALEFICENT, which was released in May 2014, and ALICE IN WONDERLAND, which came out in 2010. Other live adaptations in the works are the ALICE IN WONDERLAND sequel, ALICE THROUGH THE LOOKING GLASS set to come out May 2016, THE JUNGLE BOOK set to be released 2015, CINDERELLA set to be released March 2015, and a BEAUTY AND THE BEAST remake with no set release date as of yet. The Disney live action remakes have been doing well so far, with ALICE IN WONDERLAND bringing in over $1 billion worldwide and MALEFICENT earning $631 million worldwide so far. However, these remakes have taken on a darker tone than Disney is usually known for. Hopefully, this live action adaption will be more family friendly and more true to Disney’s traditional wholesome ways than MALEFICENT or ALICE IN WONDERLAND.